Dimensions: 2 1/2" x 3 3/4" x 3/4"
It's "all in the cards" when you choose Fashioncraft's Perfectly Plain Collection playing cards as your party favors. 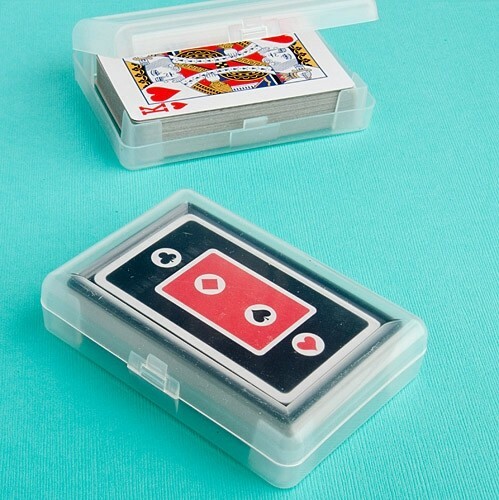 Inside a hard-molded plastic case is a full playing card deck with a colorful red-and-black suits motif on the back of each card. "First, let me say that I really loved shopping on your website for bridal shower favors. it was so much FUN! And second, I want you to know that I could not be more happy about how my order turned out. You did a GREAT job personalizing the favor boxes. " Janet H.